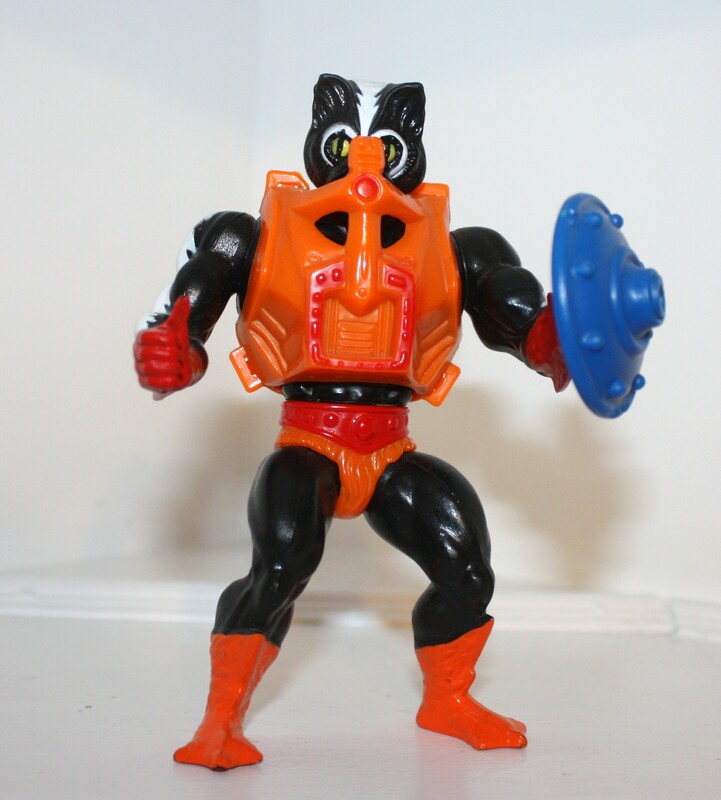 My memories of playing with Stinkor as a kid are permanently etched in my brain, and for good reason. Smell, more than any other of the five senses, is associated with memory. For me a familiar smell is like a very brief trip in a time machine back to the past. Stinkor quickly dominated my toy area. 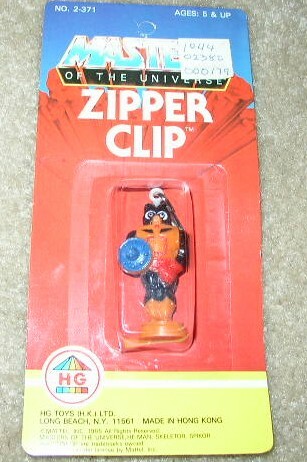 As soon as I opened the box where I stored my collection of He-Man and G.I. 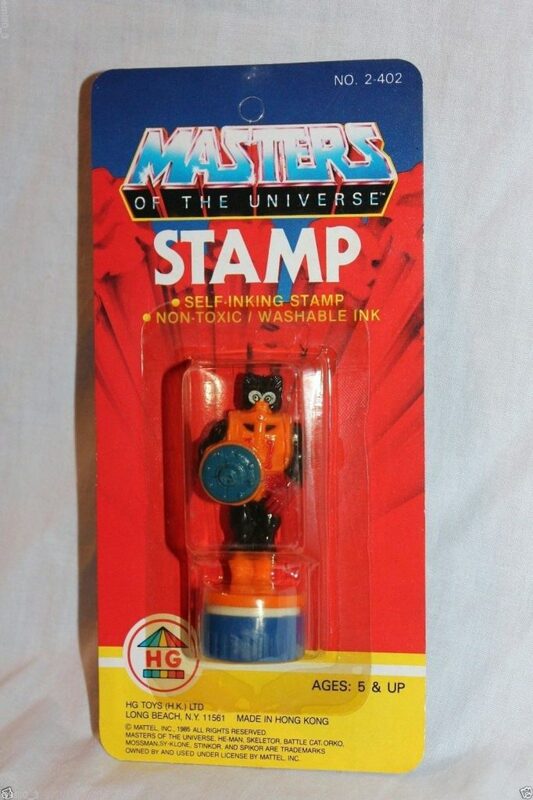 Joe figures, I was immediately hit in the face with the evil odor of Stinkor, a sharp and pungent reminder of his existence, even when he wasn’t immediately in sight. 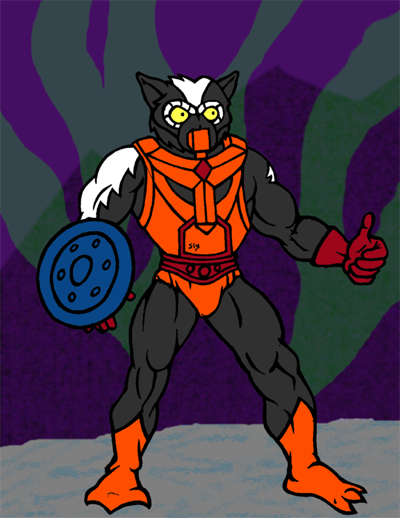 Stinkor cross sell artwork. 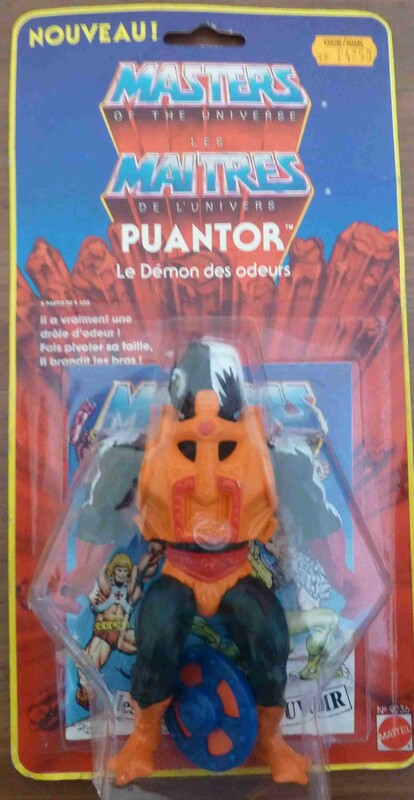 Unlike the actual Beast Man body mold, this one has a closed left hand. Image courtesy of Axel Giménez. 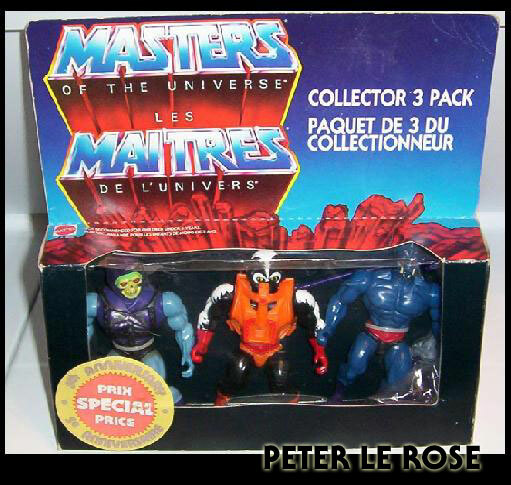 If I had to guess why Mattel opted to use the Mer-Man/Skeletor body instead of Beast Man’s body, it would be because they were already using it for Moss Man, and didn’t want both cheap repaints released that year to share the same body. 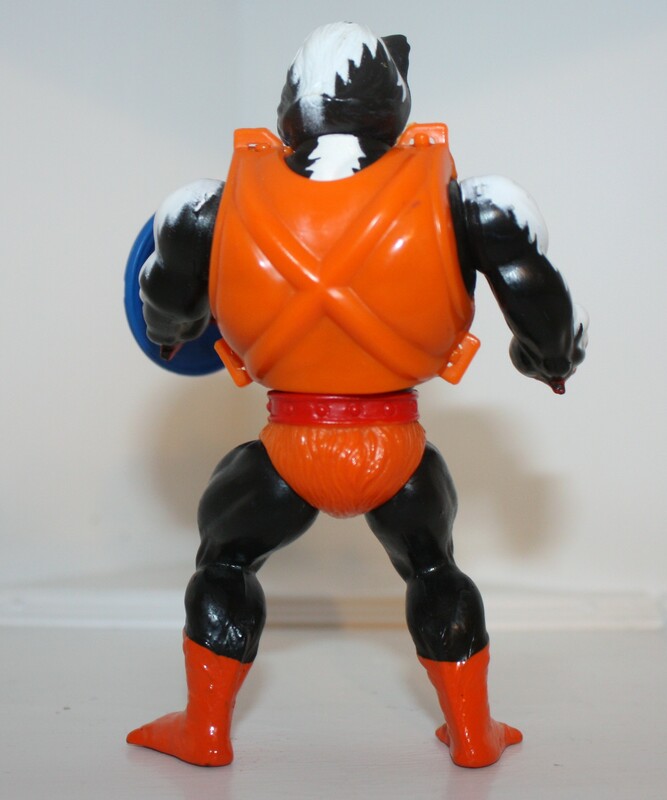 Also, the Mer-Man body makes for more obvious and distinct gloves and boots. 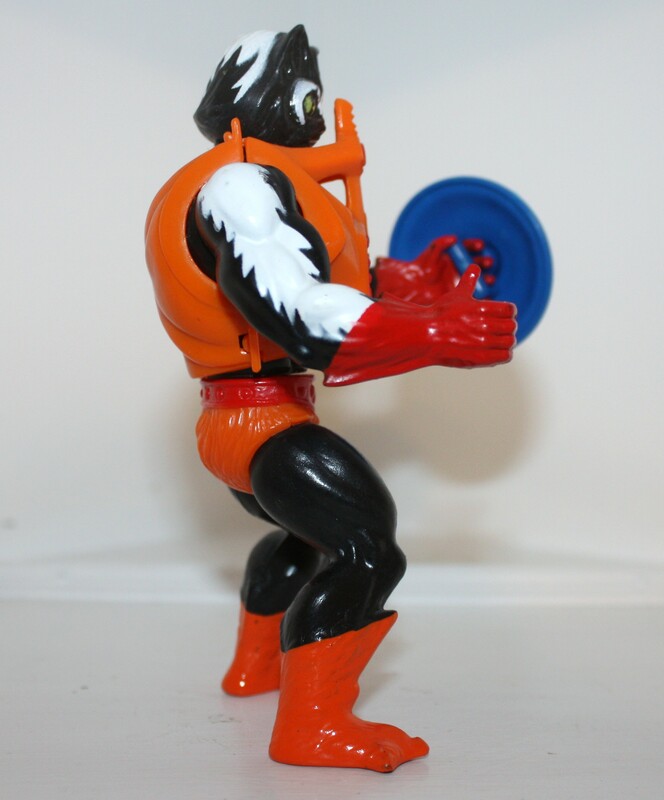 Fun fact: only Stinkor and Ninjor had painted gloves on this particular mold, which seems odd given the fact that the arms were reused many times and seem to imply the presence of gloves. 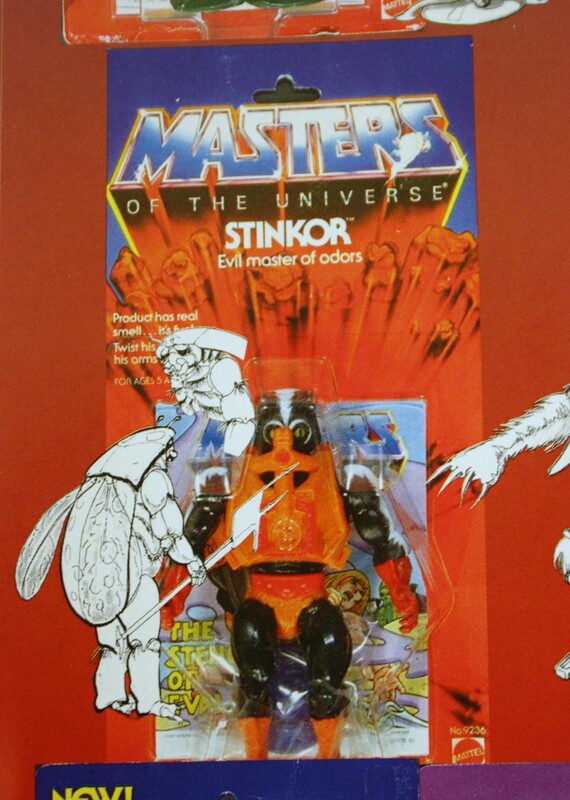 Stinkor’s distinctive smell is said to have come from mixing patchouli oil in with the plastic. I have a vintage example of Stinkor that still smells, and I have a bottle of patchouli oil, and to me they’re somewhat similar but definitely distinct from each other. 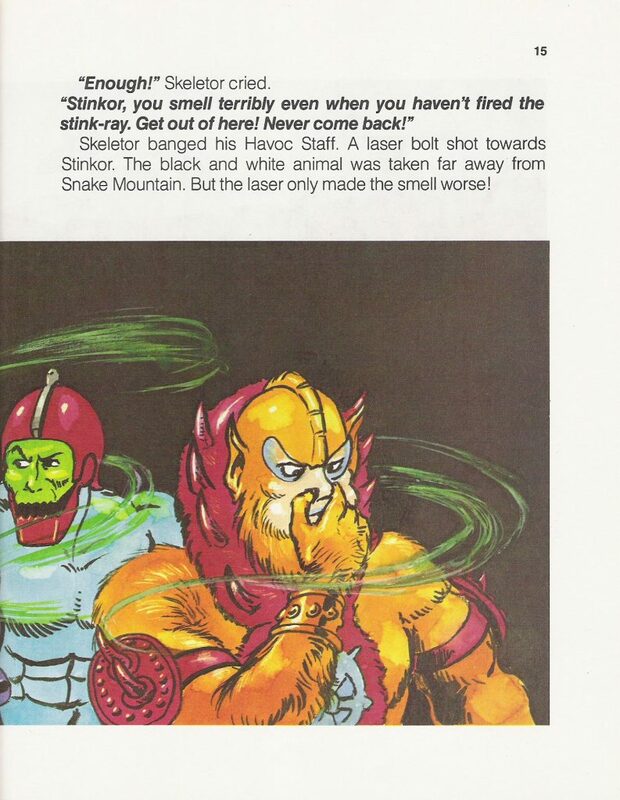 To me Stinkor’s smell is sharper and less organic smelling than the patchouli oil. Perhaps the smell changed when the patchouli mixed in with the plastic, or perhaps Mattel used another fragrance entirely. Character Profile: This warrior literally reeks of evil. His powerful stench overcomes all who smell it. Most of the Evil Warriors have built up a tolerance for their foul-smelling friend. 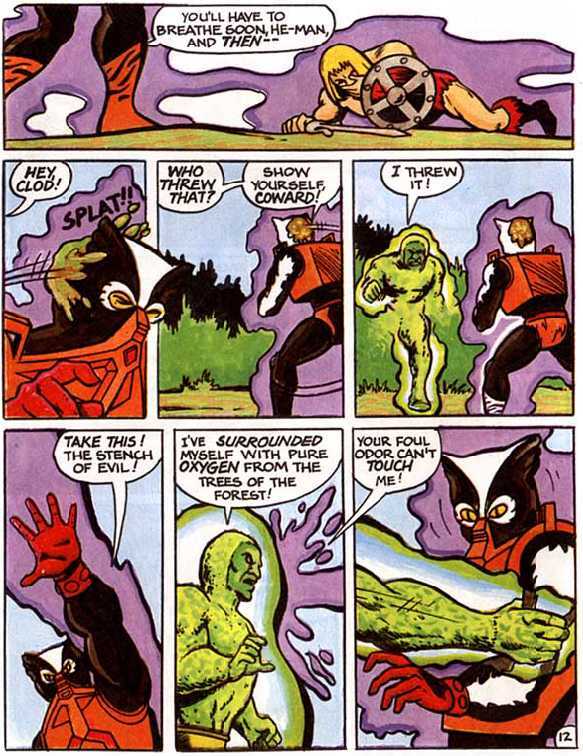 However, Stinkor can’t stand the fresh smell of his arch-enemy, Moss Man. 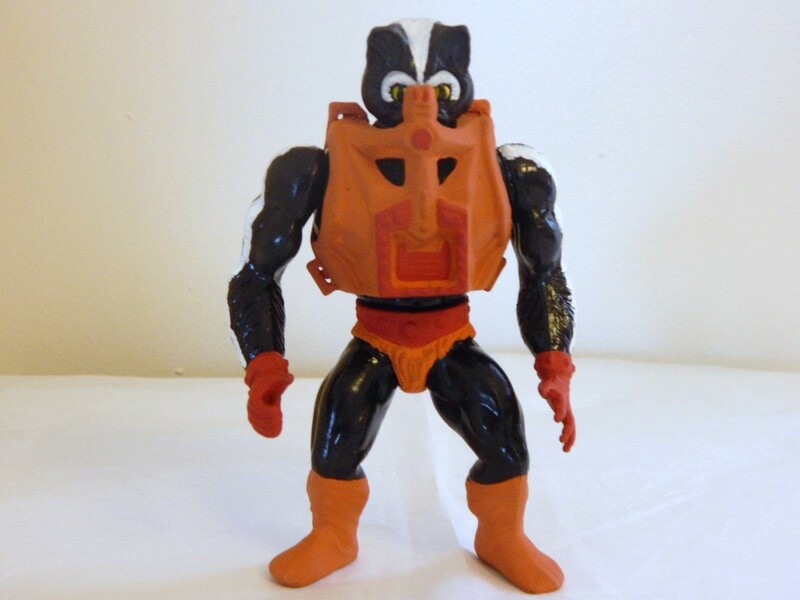 The Stechn of Stinkor is so powerful that even he can’t stand it sometimes., so he is outfitted with a special gas mask armor. 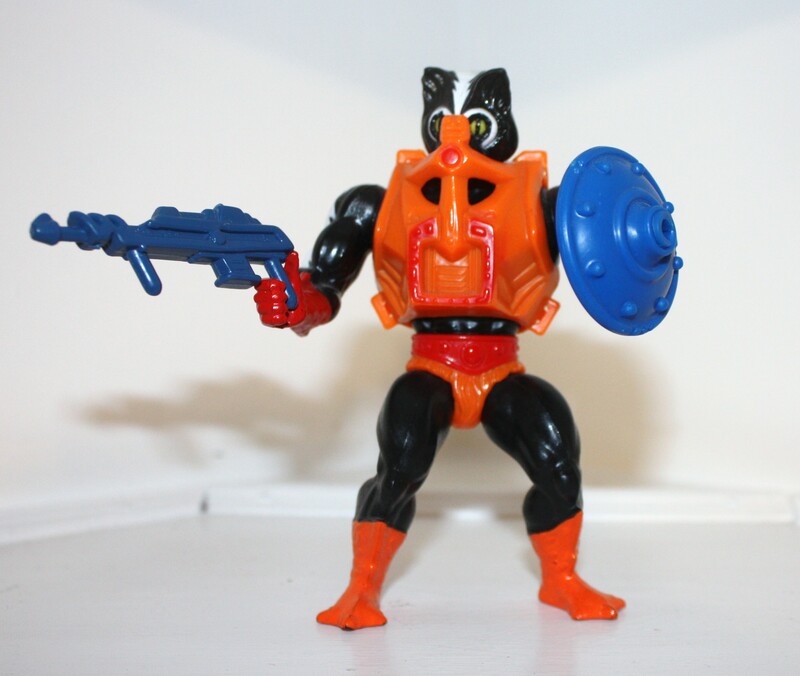 In some versions of the French release of Stinkor, he came with a blue and orange version of He-Man’s shield rather than a blue Castle Grayskull shield. 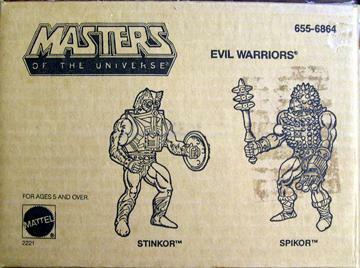 Stinkor was also released in several gift sets; a three-pack with Whiplash and Webstor, a three-pack with Battle Armor Skeletor and Webstor, and a J.C. Penny two-pack with Spikor (images via Grayskullmuseum.com). 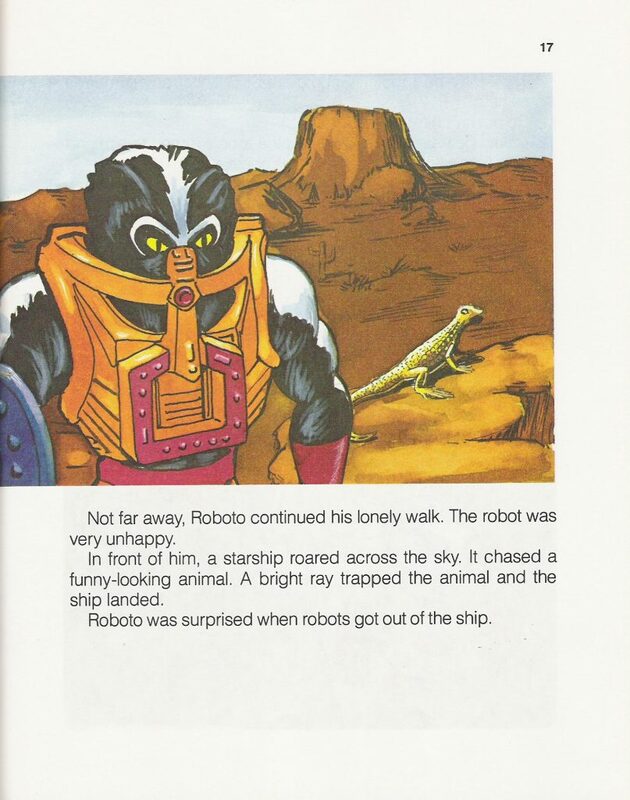 Stinkor was also the focus of a Golden Books story called He-Man Smells Trouble. 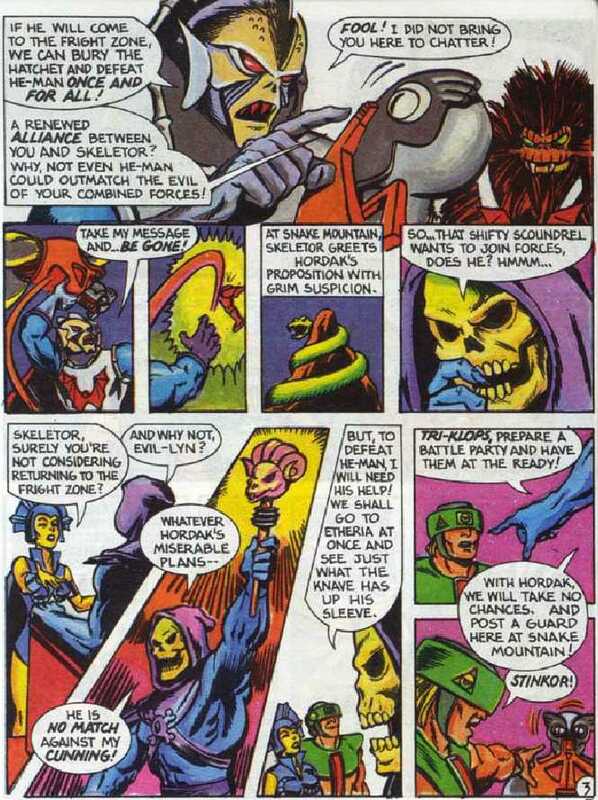 In the story, Stinkor is exiled from Snake Mountain because no one can tolerate his foul smell. 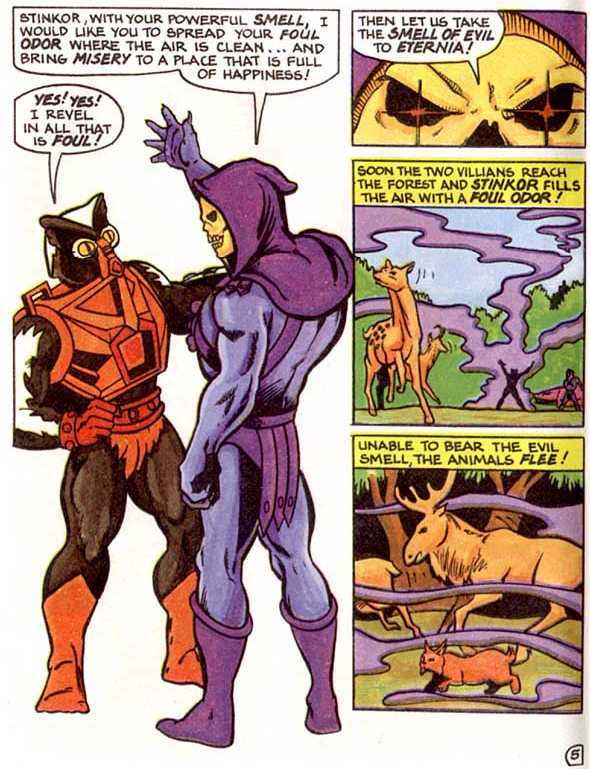 He teams up with Roboto, who left the palace over a misunderstanding, but things go awry when Stinkor tries to betray Roboto to get back into Skeletor’s good graces. 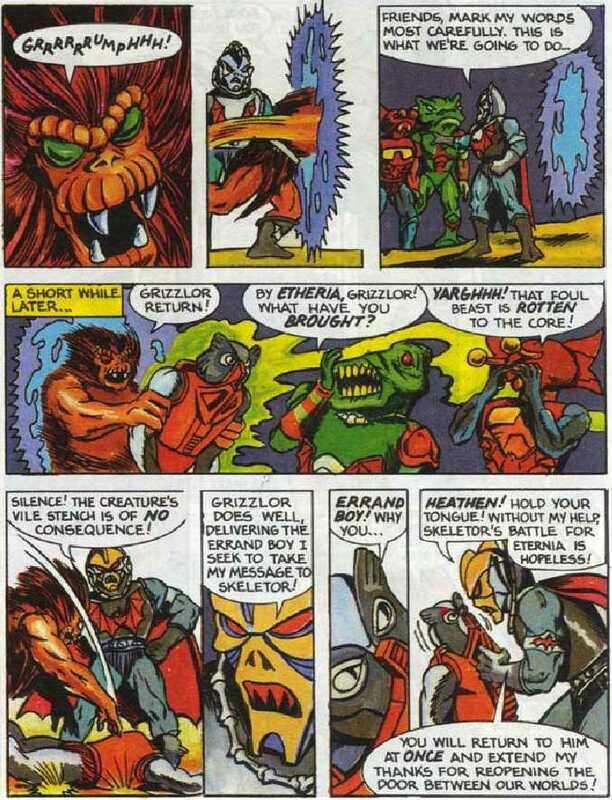 Stinkor was never a central character in the Masters of the Universe mythos, but he seems to be well-remembered. 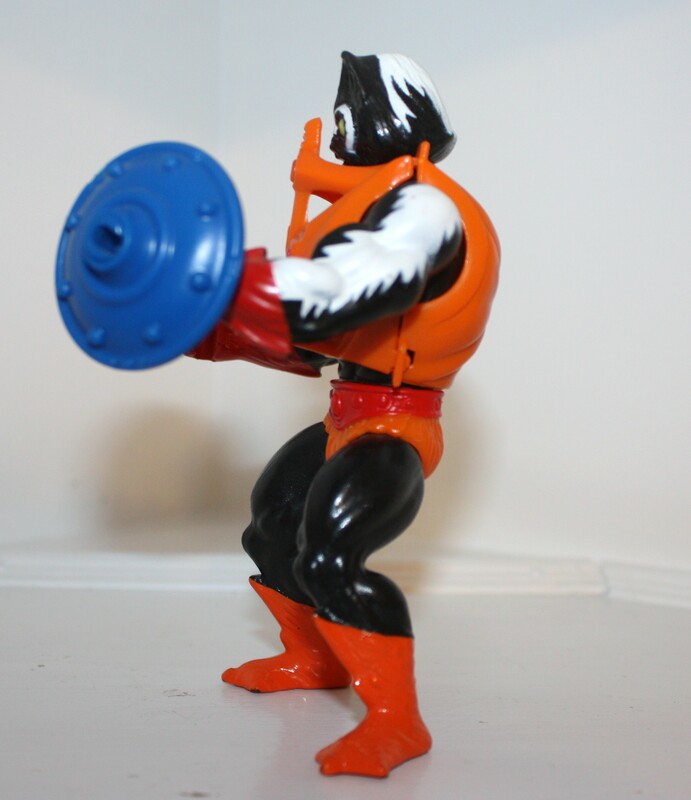 Stinkor has been featured in several articles in recent years, and from the comments even casual fans seem to remember the skunk-themed toy well. As Robert Lamb now explains Filmation were not all that happy with the character. 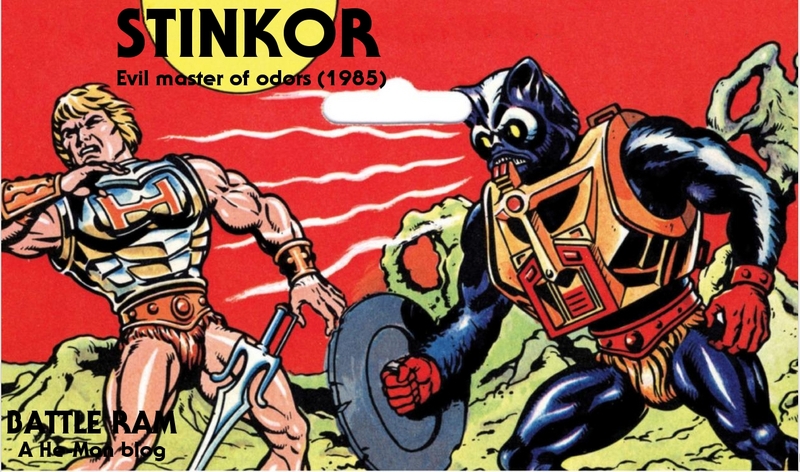 “I remember Stinkor. I was part of the writing staff when Arthur Nadel and crew took a field trip to Hawthorne, California to Mattel headquarters. The She-Ra toy line was introduced to us by women designers who displayed how capes could be used as skirts on the dolls. It was kind of a “Barbie Goes Barbarian” thing. Then it was the guys’ turn and we got our first look at the Horde. The male designers introduced each character with great excitement, relishing every nasty attribute they could name. The only hitch came when Stinkor was introduced. Arthur immediately vetoed a character that was basically a walking fart joke. Only two skunk characters have worked in cartoons to my knowledge; Pepe Le Pew and Flower from Bambi. 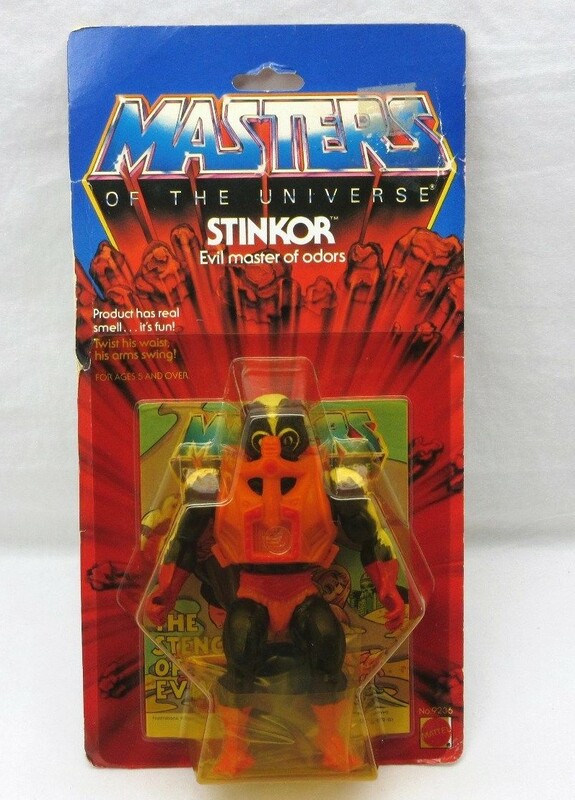 Ah Stinkor.. still got mine, still smells.. 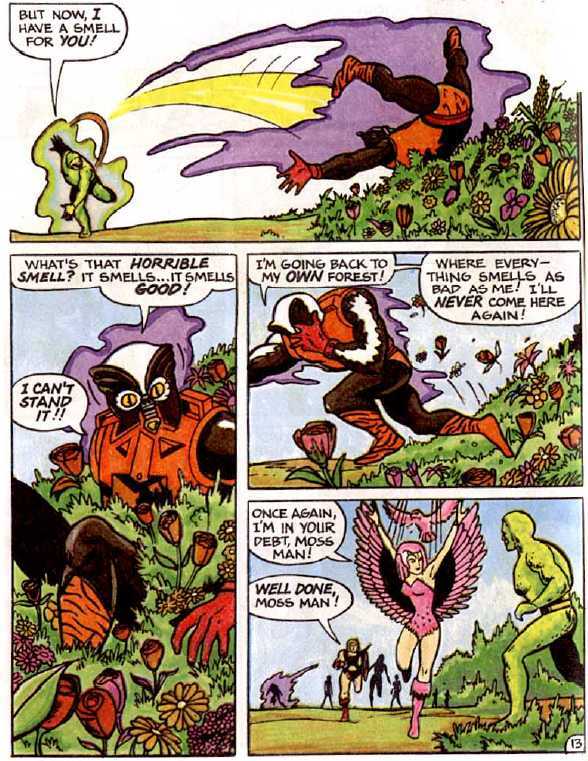 I can’t say I ever found it a ‘bad’ smell though ^_^ like with Moss Man really.. though I think I prefer Stinkor.. 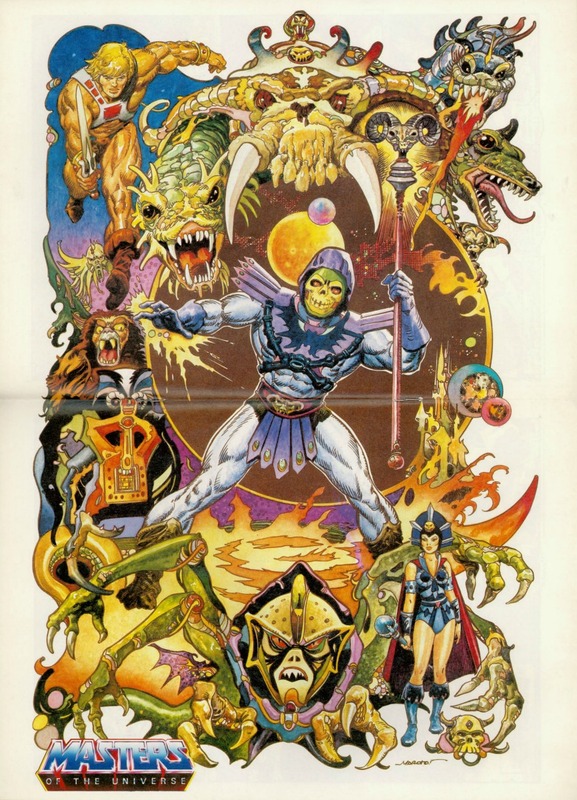 Always found it amazing that while it was the same head as Mer-man, look just how COMPLETELY different I looks with that paint job? quite interesting how they often tried to make the mouth guard from the armour into a breathing device despite him liking his own smell where no-one else did. I actually liked how he smelled too. It was like a slap in the face at first, but I did like it. I think I like it even more now. Yes, it’s amazing how much difference a new color scheme can make. It’s really very dramatic. 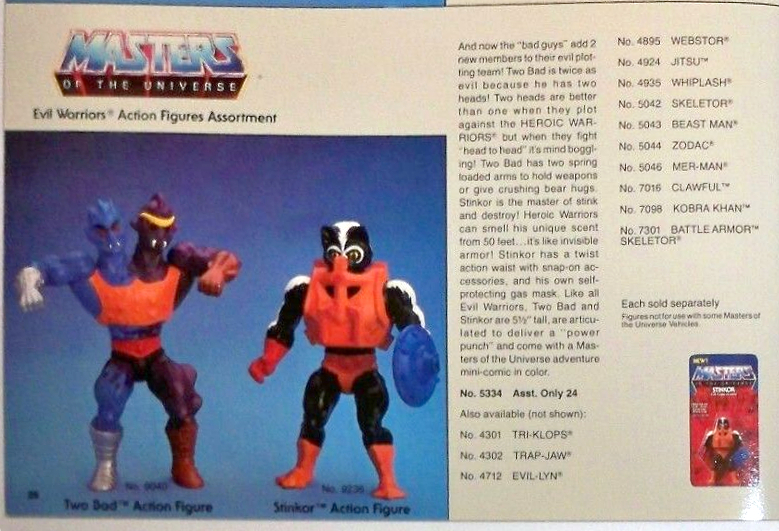 Moss Man is a bit more obviously Beast Man, but Stinkor could almost pass for a new sculpt. 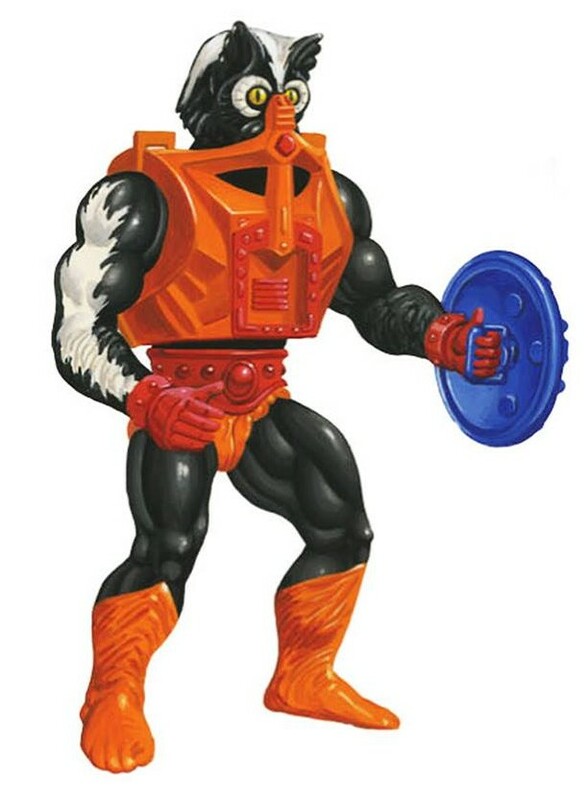 Stinkor, ahahah good memories. I remember that i bought him because I liked the color scheme and out of curiousity about how his gimmick works: I supposed that it comes with some sort of stinking liquid to use on the figure a limited quantity of times, instead I was amazed to discover that the figure actually smells on its own “power” (and still does). Ahh, Stinkor. I remember one Summer, circa 1985, I saved and saved and SAVED my pocket money for him. 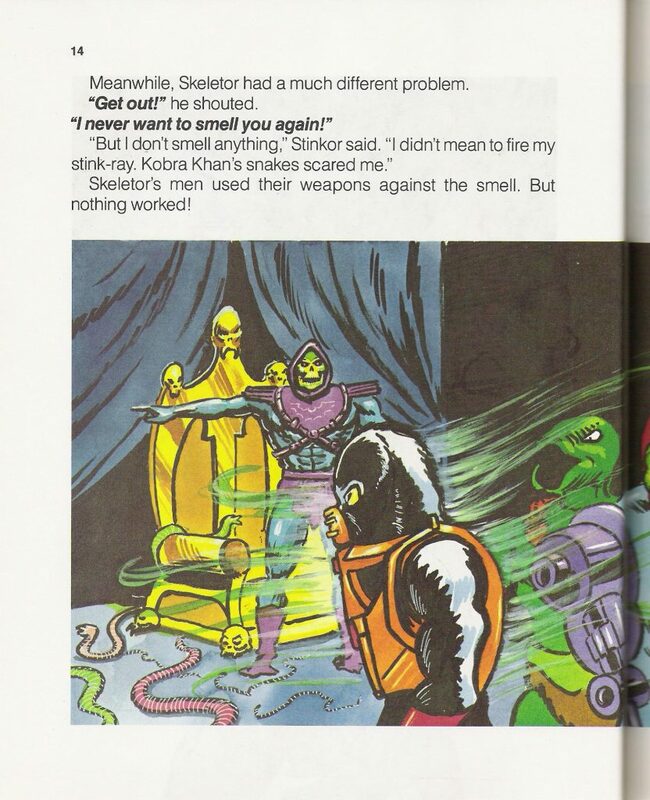 Although I wasn’t too much into ‘gross out’ toys, the fact that there was a MOTU figure that, supposedly, smelled SO BAD seems to have really appealed to me. I vaguely recall some holiday or family event or something, and my desperately saving enough pocket money before then to buy him and take him to whatever function it was. 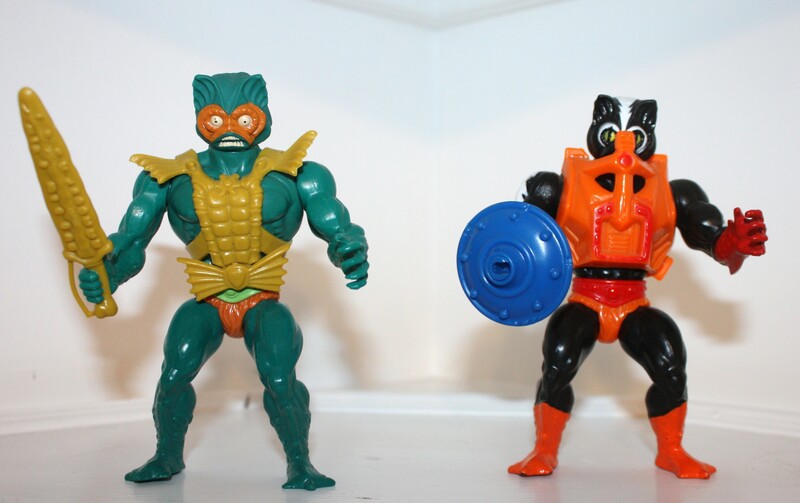 Although my main love is the first two waves, for some reason I never had the Mer Man figure, so I don’t think I consciously recognised for some time that Stinkor was quite a ‘simple’ Mer Man repaint (likewise, I never originally had Mekaneck, so I didn’t realise about his armour). 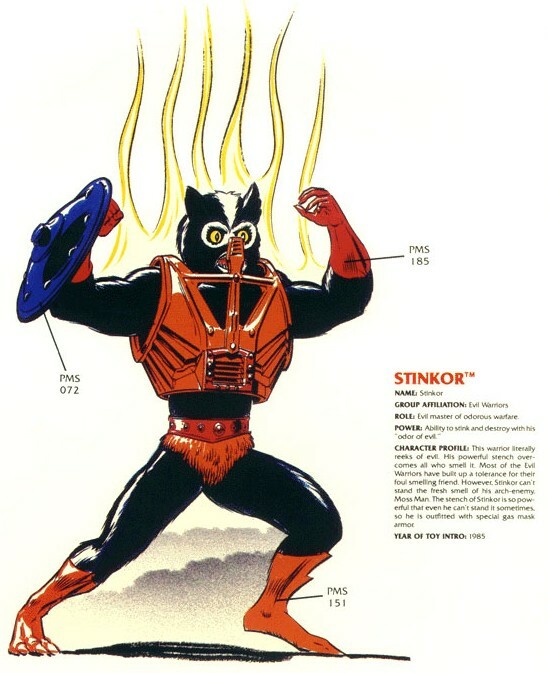 I think when I did observe this, a year or two later, it did sour my opinions of Stinkor slightly. Enough for him to get beaten up far me often in my toybox battles, at least. 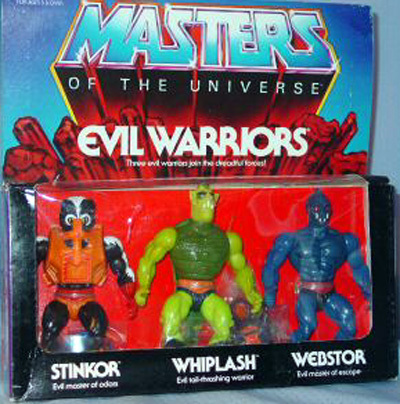 I remember my Stinkor having a VERY strong smell too. The first thing you would notice when opening my toy box was the strong smell (which I liked). The example I own today still has a slight smell, and it seems to come and go. Then again, I think my sense of smell has also diminished with age. 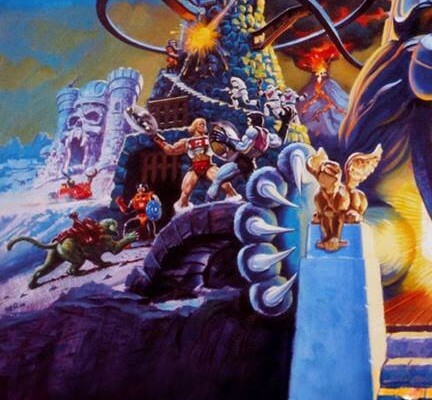 I’ve commented on this article long ago, but one thing I’ve just noticed regarding the French version coming with a recoloured He-Man shield – on the Errol McCarthy’s Style Guide illustration, if you look carefully, Stinkor appears to also be carrying a He-Man-style shield here too (albeit the orange sections being black or dark blue). 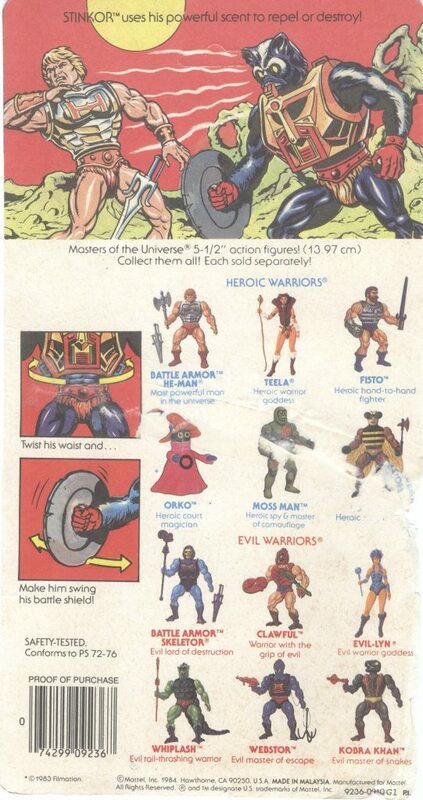 I wonder if the He-Man-type shield had been considered as the regular version’s weapon at some point (maybe influencing it coming with the French variant)?